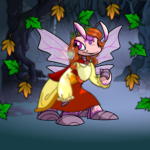 It's October, which means it's time to think about what to dress up your Neopets as for Halloween. Too bad some of the best costumes in Neopia aren't wearables. Here is a list of the top 10 unwearable costumes that some of us wish TNT would make into wearables in the near future *hint, hint*. Power hungry Neopets should make Masila their costume of choice. Known as the "Mistress of the Double-cross", she will stop at nothing to get what she wants. Some would call Masila manipulative, but she prefers the term "persuasive". When donning on the Masila costume, Neopets can channel their inner persuasiveness which could possibly lead to receiving more candies when they are trick-or-treating. This costume would also be perfect for those who plan on trick-or-treating in the colder climates because it comes with a beautiful purple cape that is sure to keep any Neopet warm. Vira is known for going around Neopia trying to pick fights with Neopians (most of us have probably gotten the random event where Vira asks if we fancy a fight in the Battledome). What better way to annoy those who don't enjoy battling than dressing up as this persistent Acara and bringing the fight to their front door? Just make sure that if your Neopet decides to dress up as Vira they have their claws well groomed (eg. painted a nice bright red) and horns shined because nothing would displease Vira the vain Acara more than knowing someone was impersonating her without making sure they looked their absolute best. The Count Von Roo Costume is probably everyone's favourite costume for the Halloween season. With the current vampire fad going around, what better costume is there than to dress up as the famous vampire himself? Too bad the costume isn't wearable. That means there will be no surprising people with Count Von Roo walking around in the daylight and no taunting to take away other pet's levels when they lose in a game of fake Deadly Dice. This makes Halloween so much less fun than it could have been. Have you ever dreamed of having a Werelupe of your own but didn't have enough Neopoints to buy a Halloween paint brush? Well, with the Werelupe Costume you don't need to buy an expensive paint brush; you don't even need a Lupe! Any pet of all different sizes and age can wear this costume. In addition to being a cheap costume, you don't have to fear for your life when you're near your "Werelupe". Everyone knows how ferocious these beasts can be; just think how great it will be to have one that is tamed and sweet. Now imagine having a group of pets dressed up as Werelupes during Halloween. It'll scare any unsuspecting home owner who thinks they're being attacked by a pack of them. Captain Scarblade is one of the most ruthless pirates to ever sail the high seas. He's best known for his attempts on trying to destroy Maraqua just for the fact that it exists. He was defeated by the Maraquans the last time he went to war against them, but never count this pirate out. Rumour has it he's been slowly plotting his revenge and waiting for the right time to make his return. If you listen carefully, sometimes you can hear his maniacal laughter. Some say the laughter is Captain Scarblade's way of letting his loyal followers know he'll be back. Those who want to go and give those Maraquans a good scare would love nothing more than for this costume to be made wearable. King Jazan is probably one of the most controversial characters of all of Neopia. With his wrong doings during the Lost Desert Plot and his helpfulness during The Faeries Ruin Plot, one can't help but have conflicted feelings towards him. However, one thing that we all know for a fact is that he sparked the ever popular "guyliner" trend that spread throughout all of Neopia. It is undeniable that he made putting on mascara look manly. This antihero is hated yet loved at the same time. His costume would look great for any fan paying tribute to not just their favourite villain but also their favourite hero. It truly is a wonder why his costume can only be stared at and not worn. Lord Kass is the iconic super villain who followed in the steps of his predecessor Lord Darigan. Most Neopets probably know him from the silly game Kass Basher, but behind all that silliness is a powerful general who almost destroyed Meridell. Unfortunately, the younger generation are not aware of his evil prowess and see him as nothing more than a silly doll that people whack for fun. It is up to the older generation to help educate these youngsters by revisiting the horrible memories of the past. By wearing the Lord Kass Costume and other Darigan costumes, the older generation can re-enact the tales of the past so it will not be lost and forgotten. A number of us still probably have nightmares about constantly refreshing on Terror Mountain trying to get the Snowbeast as a BD challenger. What better way to freak people out than to dress up like him and make them think they've finally succeeded? Imagine the look on their face when you knock on their door and scream "Trick-or-treat!". I guess the trick will be on them this time. 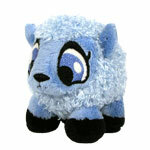 All kidding aside, the Snowbeast is one of the scariest creatures to wander around Neopia. He's a fierce BD challenger who in his spare time enjoys munching on poor, defenseless petpets in the Snowbeast Snackrifice game. Neopets around the globe probably dream about the day this costume will be made wearable. It is honestly a travesty to know that the Dr. Sloth Costume is unwearable. We're talking about one of the first evil villains of all time right here. Not only is he the first entry on the Gallery of Evil, he is also the most well known super villain in Neopian history. It's preposterous to think that his costume is deemed unwearable. He is always roaming somewhere over Neopia planning his next big move. Despite his lack of recent activities, no Neopian goes to sleep without the fear that they'll wake up to destruction and mayhem. Has no one ever thought about how much safer we'll all be if Dr. Sloth thought we're all his evil minions? With our pets all dressed up as Sloth, it can possibly make him believe we're all his #1 fans and maybe, just maybe, he'll leave Neopia alone.